There has been a lot said about Grandal's skills behind the plate. He is noted by the sabermetrically inclined for having superior pitch-framing skills. While others say that he can't throw runners out and his recent knee injury to his ACL/MCL has limited his mobility (he had a torn ACL/MCL). Whatever the case, he will pair up with AJ Ellis as the Dodger backstop. At this point, I think it's too early to tell who will be the Dodgers primary catcher. Grandal is likely to hit better than Ellis (and with more power), but Ellis has the trust and respect of the Dodger staff (which Grandal appeared to not have in San Diego). BTW, it should be noted that Grandal was busted for PED's after his fantastic 2012 rookie season. 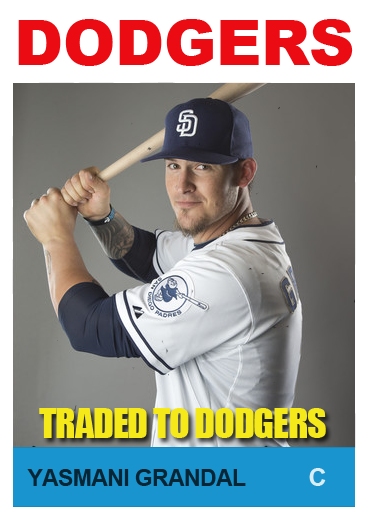 Via Pedro Moura at the OC Register, "Grandal is a gamble for Dodgers." He is a catcher, one with a superb ability to frame balls so they look like strikes, and he has a .350 career on-base percentage, seventh-best among active catchers. He has hit 24 home runs in the equivalent of a season and a half of work – and did it playing half his games in Petco Park, one of the most homer-suppressing stadiums in the sport. But the second school of thought is that Grandal is barely an average hitter for a catcher, with questionable skills behind the plate. The case for that: Grandal’s offensive statistics after his 2012 rookie season look a lot different than they did during it, and, beyond pitch-framing, his defensive numbers have never looked all that great. Can Grandal have the kind of break out season the Dodger front office, no doubt, are hoping for? Can he field his position at the dish with sufficient skill? How much defensive skill at the catcher position are the Dodgers willing to give up for offensive prowess? We won't know any of these answers until we are well into the year, so be prepared for an interesting 2015 Baseball season. In celebration of Grandal's arrival to the Dodgers I made the above fantasy card for him. I used a photograph grabbed from a photo from Zimbio (Mike McGinnis/Getty Images North America) and the 1964 Topps Baseball card design. I came across this photo on eBay and immediately had to figure out what this was. As you can see, former Dodger manager Walter Alston is with Superman. But who is playing Superman and what is this for? In the spring a young man's fancy turns to baseball. Okay, the love of baseball. And Florida is covered with a migration of the best baseball players in the land. It's called spring training. I'm going to spend several weeks at ten of these training camps making a one-minute or thirty-second TV recruiting spot at each camp. We'll shoot on the baseball diamond with the players in the background. In the foreground will be that team's manager talking with Superman, me. I get to meet and work with Joe Torre, Yogi Berra, Walter Alston and seven other managers. Plus, I get to meet some of the players. It was a baseball fan's dream. That was the good news. The not-so-good news was that I have to get dressed and have make-up put on in the team's locker rooms. Via Matthew Moreno at DodgersNation, "Matt Kemp Booed At Clippers Game, Doc Rivers Calls It ‘Cold’"
Via J.P. Hoornstra at Inside the Dodgers, "Reports: Dodgers will pay $18 million of Matt Kemp’s salary in 2015." Via Ron Cervenka at Think Blue LA, "Juliomania? There could be more parallels with Fernandomania than just the pitching." 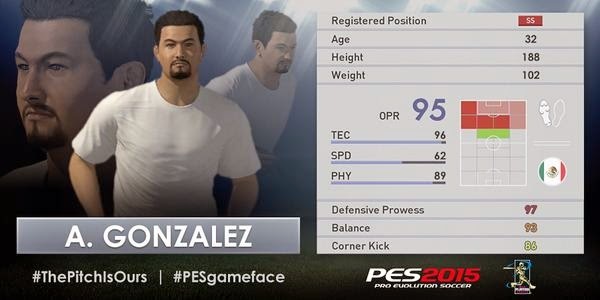 MLBPA must have some sort of deal with the Konami video game Pro Evolution Soccer 'cause they have several 'create-a-player' videos on youtube right now, and Dodger first baseman Adrian Gonzalez is one of them. Check out a couple of videos below of them creating AGon and another video of some AGon gameplay of PES2015.